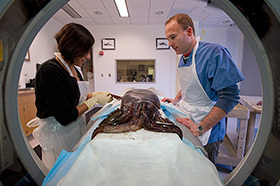 The Computerized Scanning and Imaging Facility (CSI) (http://csi.whoi.edu) has operated a Siemens® Volume Zoom Spiral Computerized Tomography (CT) Scanner since 2001. This CT scanner is capable of imaging a wide range of materials and tissues, ranging from air to dense metals, at 100 micron voxel resolution and at a rate 0.5 m/sec. 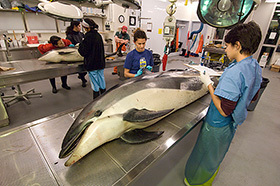 The necropsy facility consists of one large necropsy room equipped with two 4 meter down-draft tables, one hydraulic large animal table, four overhead surgical lamps, several light boxes, overhead rail and lift systems, and one large fume hood. 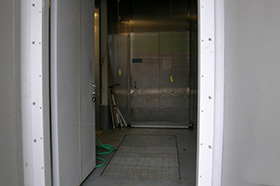 The -20° C freezer and +4° C chiller have built-in overhead rail and lift systems for transport of animals and specimens to and from outside receiving areas into the necropsy or scanning room. 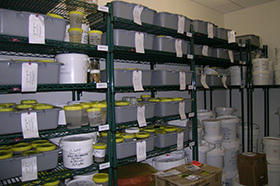 The storage room is a vented, temperature controlled room used primarily to store samples that are preserved in Formalin or other volatile chemical preservatives.